Our team is out in force at the 2016 Concur Fusion Conference in Las Vegas. “Concur Fusion is a great way to bring people together to discuss the topics, challenges and new ideas around travel, expense and invoice programs. 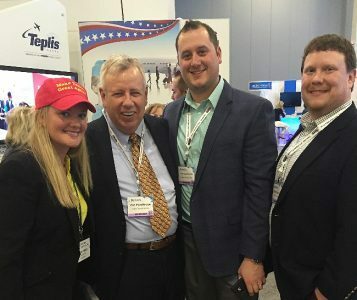 And we may get to have a little fun in the process!” – Van Henderson, Senior VP, Account Management at Teplis Travel, pictured above with Courtney Guidera of Concur, and Teplis’ own Tony Cocchiarella and Matt Campbell. As part of our commitment to help and enhance the lives of others, we support in the charitable focus and donation for Concur’s client, St. Jude Children’s Research Hospital. We encourage others to follow suit by participating in the opportunities available to donate and pack kits for kids.